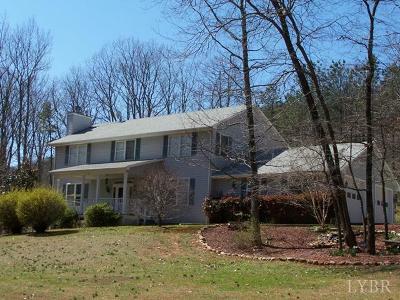 Great location in Campbell County between Rustburg and Concord. Lovely 4-bedroom home on 3 acres. Home features large kitchen with granite counters, breakfast nook, formal dining room, and living room with fireplace. There is also a den, half bath, and laundry room on the main level. Upstairs are four bedrooms and 2 full baths. Master bath has double vanity, whirlpool tub, and separate shower. Hall bath also has double vanity. Full, unfinished basement with woodstove that conveys. Attached 2-car garage. Beautifully landscaped with a variety of flowering trees and plants. Enjoy grilling in the summer on the large back patio. Private, secluded 3 acre lot. Numerous updates have been done to this home - call for all the details. Comes with American Home Shield Home Warranty.